Milan -New AC Milan coach Gennaro Gattuso warned on Tuesday that the former Italian giants must suffer if they want to return to their glory days. Gattuso, a key figure in some of Milan's best ever teams, took over as coach on Monday after Vincenzo Montella was sacked following a disappointing start to the season. The seven-time European champions, once the world's best team but now way behind their traditional Serie A rivals, released Montella after a goalless draw against Torino left them seventh in Serie A, 18 points behind leaders Napoli. "It's an important day, a big responsibility," said 39-year-old Gattuso, who was promoted from coach of Milan's youth team. "We need to prove that we're willing to suffer and be a united squad. We'll need a battlefield spirit. "It's going to be a tough job, this team has 16 nationalities and an average age of 21. They're not having an easy time, but everything is in place to work well." AC Milan have not finished higher than sixth in Serie A in any of the last four seasons. New Chinese owner Li Yonghong funded a 230-million-euro ($270 million) spending spree in the summer, but it has failed to produce immediate results and Milan lie seventh in Serie A. Since retiring as a player in 2013, Gattuso has enjoyed mixed fortunes as coach, with short stints at Sion in Switzerland, at Palermo and Pisa in Italy and at Greek minnows OFI Crete before joining the Milan youth setup in May. 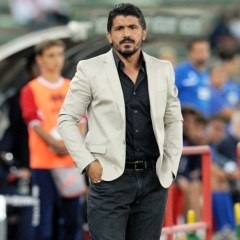 "I've over 100 matches behind me in different championships," insisted Gattuso, defending his credentials. "It's up to me now to get results." A combattive defensive midfielder, Gattuso made a total of 468 appearances for AC Milan between 1999 and 2012. He won the Serie A title in 2004 and 2011 and helped Milan to Champions League glory on two occasions in 2003 and 2007. "I feel the same emotions as I did when I was a player, when I come to Milanello it's like I'm in heaven," he continued. "Right now I'm not looking at the table, I'll take it day-by-day. The match against Benevento (Sunday) has to be like a World Cup final." Gattuso is looking to inspire the players with AC Milan's glorious past, which includes 18 league titles and seven European Cups, both of which they last won in Gattuso's days as Milan player, in 2011 and 2007 respectively. "There are plenty of photos at Milanello that remind us that this club has a great history. "We can't forget Milan's DNA." Milan chief executive Marco Fassone said he fired Montella "with a lot of regret". "It was a painful decision due to the relationship we'd created with Montella, for a project which hasn't gone forward as we'd hoped it would this summer," said Fassone. "We didn't choose Rino (Gattuso) to plug a hole, but because he's the right choice at this time. Given Rino's history he knows the environment and the dressing room. "In recent months he's shown what it means to be a Milan coach. It's a choice we wanted to make, we've not pulled an emergency parachute."